Lillegard's passion is helping entrepreneurs bring their ideas to market. Following early career training in the software industry as a project manager, business analyst, and sales manager, Lillegard received his MBA from the Lundquist College of Business in 2006. Lillegard was founding CEO of Floragenex, a genomics research company based on technology developed at the University of Oregon. Floragenex, which was developed through the UO Technology Entrepreneurship Program as part of Lillegard’s MBA studies, moved from lab to market with a combination of grant funding, Oregon-based early stage investment, and a strategic investment from a seed company in Illinois. 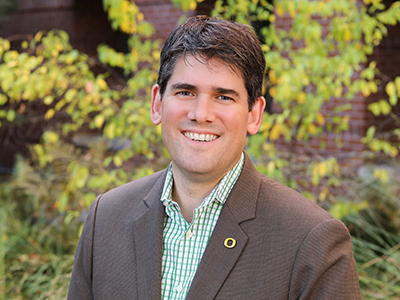 In his role leading the Lundquist Center, Lillegard plans and delivers Oregon’s Venture Launch Pathway series of MBA courses, coaches student teams competing in national and international business plan competitions, and also leads the Technology Entrepreneurship Program (TEP). TEP engages UO MBA, Law, and PhD student teams in the evaluation and commercialization feasibility analysis of technologies sourced from Oregon technology partner institutions including ONAMI, OregonBEST, NETL, PNNL, OHSU, and the University of Oregon Tech Transfer Office. A piece by EugeneRAIN dives into the partnership between the Eugene/Springfield startup community and the Lundquist College of Business. Oregon MBA venture team startup Feros Freight Innovations aims to add batteries and electric motors to freight trailers to realize cost savings and reduce emissions. Oregon MBA students found success pitching the idea for an electric freight trailer startup in Thailand. The Lundquist Center for Entrepreneurship is pleased to announce a new partnership with Oregon startup accelerator Starve Ups. New student group Duck Ventures, focused on educating students and community members about venture capital, has quickly found an audience. The greater Eugene/Springfield community is a unique place for female entrepreneurs, and the Lundquist College of Business has amazing success stories. Oregon MBAs are winning big on the international business plan competition circuit. Lundquist College of Business students and faculty found themselves flying to lands near and far during a summer packed with learning, research, and curriculum development. Lillegard works with a variety of small businesses on startup and growth strategies. These range from technology licensing and development efforts to consumer products and Internet ventures.